There are several reasons for giving it higher visibility; most recently I’ve noticed that China Telecom, a Chinese state-owned enterprise (SOE) is accepting bill payments in Bitcoin. Real estate prices are continuing to rise in the cities in spite of government efforts to dampen the price rise. Bitcoin offers a chance to take some excess cash out of the system, and thus dampen price inflation. The party is going after corruption among Chinese officials. Even though the party needs to clean up, it needs to give its own members an exit plan, as too much prosecution would make the people think that the party is completely corrupt. Since November 2008, the US Fed has been injecting liquidity into US banks at the rate of US$80B a month as part of the quantitative easing plan. This means that 4.8T has been injected into the global economy in the past five years. US banks have tightened their lending requirements, which means a lot of this hot money has made its way to China, where it is fueling inflation. This is in addition to US1-2T of cash in Hong Kong banks which has nowhere to go except China investments. Too much liquidity fuels inflation. There has been a lot of talk about China dumping US treasuries if things got hot between the US and China. This is a dumb strategy. Instead, China needs to soak up a lot of the US$ liquidity, and promote the Chinese yuan as an international currency. By promoting the yuan, the US would have to raise interest rates to acquire US$ buyers, making the cost of the US$ higher for its issuer, the Fed. 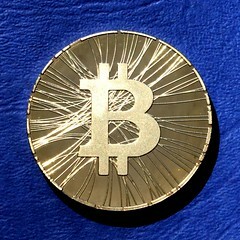 A lot of the discussion about Bitcoin has centered on its not being widely accepted. This misses the mark. For two years before the euro was officially introduced as a currency in the EU, it was used for settling accounts among banks. To a large extent, Bitcoin replaces banking services. If it is used among more individuals for settling accounts, it will have a valuable role. Right now, that is just beginning, since the amount of Bitcoin in circulation is just US$15B, which when compared with the other amounts mentioned above, is a very small amount. Most Chinese buyers of Bitcoin are using it not as a spending currency, but to hide and protect their currency and asset savings. They only convert from Bitcoin to cash when needed. Compared to banks and individuals who need to report large cash transactions, Bitcoin is anonymous. This makes it ideal for international currency movements. This trend is just beginning. (I hate copying such a large chunk of the text instead of just linking to Quora, but Quora is pretty hostile to readers that aren’t accessing Quora in just the right way, so there you go.